Since the passing of LDS President Gordon B. Hinckley I have read many articles and seen many pictures in tribute to this great man. But today I listened to a tribute that brought tears to my eyes. I share that with you now. 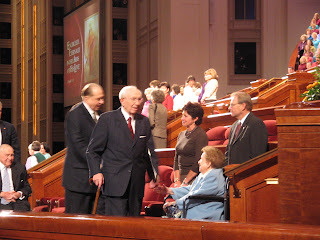 I wish I had had the opportunity to shake President Hinckley's hand as well though I did get some pictures of him. I was attending a Relief Society (LDS Women's organization) Conference in the LDS Conference Center when I remembered I had my camera in my purse. I pulled it out in time to capture this cherished picture. Gordon B. Hinckley was indeed an influence for good in my own life. Glenn spoke well. I'm not a Mormon, yet I was moved. Glenn said it better than I ever could have.